January 13 is National Peach Melba Day. It is a perfect day to indulge yourself in this tasty and simple dessert. 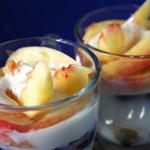 Peach Melba is a great and simple dessert invented by Auguste Escoffier, the Savoy Hotel's chef. He cooked peach Melba in honor of Australian soprano Nellie Melba, who was to perform Wagner's Lohengrin opera at Covent Garden in 1892. Escoffier used a very interesting way to present his dessert. He put it on a swan ice sculpture and topped with spun sugar. It's easy to cook peach Melba. Vanilla ice cream is topped with slices of peach (although it's winter, don't hesitate to use canned peaches) and strain raspberry purée over it. It's easy and sweet, isn't it? There are other versions of the dessert. Some of them use pears, apricots and strawberries instead of peaches. Raspberry sauce or red currant jelly can substitute raspberry purée. Did you know, that Nellie Melba asked the same chef to invent another dish for her? It's Melba toast, that was perfect for Melba's diet when she gained weight.